South End mall located on the junction of Lang’ata road and Mbagathi Way is currently under demolition in an operation targeting 4,000 buildings constructed along river banks in Nairobi. The mall belongs to former Bobasi MP Stephen Manoti and is valued at Ksh1 billion. 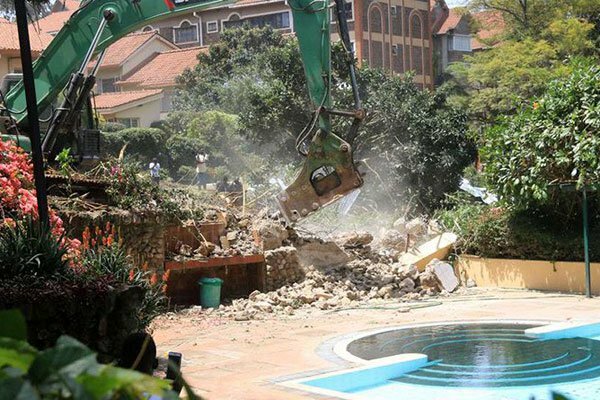 The demolitions spearheaded by the National Environment Management Authority (NEMA) started on Monday, with the demolition of Java House and Shell petrol station in Kileleshwa. The script is the same in other parts of the city where rivers have been choked by buildings set up on riparian reserves, on river banks, wetlands and even right on top of rivers. Both the Ukay and Westgate shopping malls in Westlands have reportedly been mapped and marked for demolition by Nema. In 2016, Nakumatt Ukay in Westlands was temporarily closed when floods washed through the supermarket, destroying property of undisclosed value.